The social music discovery service iLike today is adding a host of new services for artists to connect with their fans. New features include Twitter, YouTube, and MySpace syndication and tools to create personalized iPhone applications. ILike's new functionality will increase the ways fans can connect with their favorite music, and makes it easier for artists to deliver news, concert updates and other artist-related content they want to distribute. Twitter: allows artists to put a Twitter widget on their iLike page, and any updates to the artist's iLike page are automatically published on the artist's Twitter feed. MySpace: artists can place links to concert listings and syndicate their iLike blog posts onto their MySpace pages. iPhone App: using iLike's "turnkey system," artists will be able to create iLike-branded iPhone apps that can include tour dates, iTunes Store purchase links, videos, news, and other artist-related content. Most of these new features, while useful, are logical additions to increase iLike's reach into social networks. 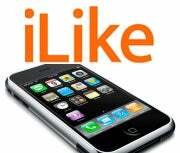 However, the addition of iLike's iPhone application tool, the turnkey system, is an interesting development. Instead of creating an umbrella application for users to access all iLike artists in a single application, the music service has instead opted to allow individual artists to create their own iPhone apps under the iLike brand. Ali Partovi, iLike's CEO, told CNET that a one-stop iLike iPhone app "isn't yet on the company's iPhone roadmap" and iLike-branded apps are targeted at fans that are particularly passionate about a single artist. The use of iPhone applications as a way for artists to connect with fans is becoming increasingly popular. Last month, Nine Inch Nails released its nin: acess application -- which had an update temporarily rejected by Apple for objectionable content before being accepted into the iTunes App Store a few days later. In February, Nineties alternative band The Presidents of the United States of America put out an iPhone app that allows fans to stream PUSA's entire music catalog via Wi-Fi or cellular Internet connection. Seattle-based iLike has been working to extend its reach into the increasingly competitive world of online music. Last year, the company introduced online full-song playback with unlimited access for Real One Rhapsody members, and in January added a feature that allows any website to add an iLike playlis using Google's Friend Connect service. ILike claims more than 300,000 artists on its service, more than 45 million active users and is available on most major social networks including Facebook, MySpace, hi5, Orkut and Beebo.